Microsoft’s new leader is making a stand, and the 3.100 word e-mail he shared publicly on microsoft’s website is the alarm bell to all the company’s employees saying: It’s in our hands alone – let’s put them to work! 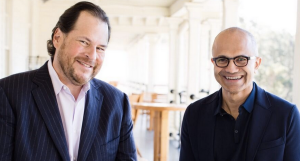 I’ve written before about what this change at Microsoft means and what are the biggest shifts from Balmer’s realm to Satya’s (and in the future to Benioff’s), and I believe it’s still taking too long for these changes to take place – but it’s not a surprise, big corporates move slow. It’s clear from the e-mail what needs to happen, and the buzz in the market confirms change is underway, so i’ll give you my two cents about what needs to happen bellow. One of the biggest challenges when you have legacy is change. It’s such a huge challenge it usually distorts the decision-making, and leads the executive teams to make decisions more concerned about legacy than what the business and it’s clients really need. This legacy is usually one of two things: processes and people (sometimes both). With the evolution of technology you sometimes replace a workflow of 5 steps and 3 people with an automated system that can save you days or even weeks. But get some “frankensteinean” smooth-change process to maintain the status quo and get even more people involved in an already unnecessary process – it’s a spiral and it only get’s messier. Get those 5 people thinking about improving customer experience and helping implement the system properly, don’t get distracted from the big goal: better product or more revenues. Talent needs to be able to reinvent itself and in most cases reinvent their jobs – there was no internet nor mobile phones when they started working – transformation start with each and everyone of us. Don’t get me wrong, this activity must be aligned with business priorities, and the results must be relevant – but it never beats the core business. Innovation must become a business partner for Strategy, Product and Marketing so it remains relevant and productive. The lean startup approach is usually the most productive – reaching milestones allow you to make efficient decisions: either it works or it doesn’t, or maybe by failing you figure out what works. What you must not do is set out to create moonshots and then cut the budget to train ride to Windsor. There are a lot of silence voices that have so many ideas to share – let them speak, don’t turn this into a round-table only the special ones get to. Big changes are usually the result of small cumulative transformations that occur on different levels of the organization. Imho, the single most relevant difference about the digital age is everything can be measured. So processes can be measured, business decisions can be measured and the market can be measured. Keeping the X-box business is a user-centric decision. It’s the one client point of contact that keeps growing for Microsoft, it’s the vehicle to the fastest growing digital business (gaming) and it’s a market study on its own. Internally, Microsoft needs to understand where information is getting stuck, and what processes are delaying the urgent decision-making processes – enterprise and data must collaborate with HR to understand this. Externally, Microsoft must stop being reactive and lead the market – listening is a critical part of that, but acting quickly is an even bigger one. Those user-centric, cloud based and mobile enabled experiences must also be relevant in context and be personal to each user in order to succeed – there’s a big role for marketing to play. Marketing must reinvent itself to bring these different factors together, by inputting relevant information to all internal stakeholders, and outputting clear and compelling stories and use cases, that the clients get, and the market recognises, creating compelling user stories and thought leadership. This is a tendency already reflected by large consultancies like Accenture and IBM that are already adjusting their operational models to be able to keep up with technology and the transformation it forces companies into – creating marketing solutions as an end-to-end solution, instead of just delivering pieces of a puzzle you need to keep changing. The transformation is underway, and I’m not surprised by rumors of massive lay-offs – it’s a shaking-the-net kind of thing to see who raises their game, who keeps their poker faces and who jumps ship to give opportunities to new blood to come into Microsoft and make it “the best place for smart, curious, ambitious people to do their best work”. And smart, curious, ambitious people are the ones looking to do their best work, and probably the work of a lifetime, Microsoft’s lifetime. Let’s see if they make it there. Looking forward to reading your comments. Let’s keep the conversation going bellow, viatwitter or on my website.